In line with several other countries, such as the Nordic countries, Austria and Quebec (Canada), as well as several middle-income countries like Chile and Mexico, Germany has drastically expanded its subsidised public childcare programme in recent decades. Until the early 1990s, childcare slots were severely rationed and demand far exceeded supply. A subsequent policy initiative aimed at providing childcare slots for each child from the age of three onwards, and it led to a large expansion of available slots throughout the 1990s. As childcare programmes are expensive, the question arises how effective they are in enhancing children’s skills. In addition, as children from diverse backgrounds enrol, one may ask whether these programmes help to reduce the early disadvantage of children from families of low socio-economic status (SES) or families with an immigrant background. Finally, as early childcare attendance is voluntary, it is important to understand whether children who could benefit the most are at the same time those children who are most likely to take advantage of newly generated childcare places. Answers to these questions are important for policymakers and parents alike. Researchers are beginning to understand how such programmes affect the development of children, depending on their family background (see Elango et al. 2016 for an extensive review of the literature). Havnes and Mogstad (2015) show that children of low-income parents benefited substantially from a large Norwegian childcare expansion, whereas earnings of upper class children may have suffered. Felfe and Lalive (2018) analyse the onset of a recent German expansion of childcare to children aged 1-3 and find that very early childcare particularly improved the socio-emotional development of less advantaged children. In a recent paper, we evaluate the large childcare expansion in Germany to address these questions (Cornelissen et al. 2018). This expansion took place over a long period, and affected different municipalities at different points in time in a quasi-random way. This provides an ideal policy experiment that makes it possible to assess causally the impact of the policy on children’s skills and on the gap between high and low SES children – and to investigate whether those who benefit most are also those who are most likely to enrol. The German universal childcare programme is a heavily subsidised half-day programme aimed at children aged three to six. Our analysis focuses on the effects of early versus late enrolment in the programme (that is, enrolling at age three versus age four or five) on child development. The analysis is based on data from compulsory German school entry examinations administered by paediatricians for all children in one large German region. We focus on school readiness, a summary measure based on a battery of school entry tests of, for example, motor skills, language, and cognitive development – all important predictors for later academic success (e.g. Duncan et al. 2007). 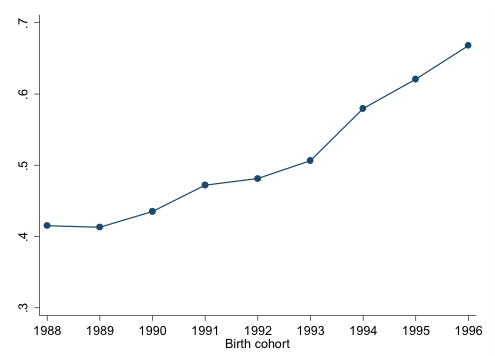 As Figure 1 shows, while only 41% of children born in 1988 attended childcare for the full three years, this share increased to 67% for children born in 1996. Our research design uses the fact that the expansion was particularly pronounced in municipalities with an initially low childcare coverage rate. Thus, especially in these municipalities, children born in the mid-1990s had a much higher probability of being offered a childcare slot at age three than children born in the late 1980s, before the expansion. At the same time, these children should not differ systematically in terms of parental background or ability. Therefore, the comparison of the relationship between childcare enrolment and school readiness across cohorts within the same municipality allows us (after netting out general time trends) to uncover the causal effect of enrolment on school readiness. Furthermore, by comparing children drawn into the programme at low levels of coverage with children drawn in only at higher levels of coverage, it is possible to estimate separate effects across types of children whose parents differ in their preferences for sending their children to childcare (see the more technical companion paper, Cornelissen et al. 2016, for details on the empirical method). Note: The figure shows the share of children enrolling into childcare early (at age three versus age four or five) for the birth cohorts that benefitted most from the large expansion of available childcare slots in Germany. Early enrolment leads to attendance for the full three years up to school entry. Our analysis shows that children from low SES families and children with an immigrant background benefit substantially more from attending childcare early than children from a high SES family background. For example, early childcare attendance improves the school readiness of children from an immigrant background by 12 percentage points, and closes the gap in school readiness between these children and children from the majority population nearly completely. Yet, immigrant children are 20 percentage points less likely to enrol in childcare early than German children. In line with the findings for minority versus majority children, our analysis more generally reveals that children who would gain the most from attending childcare early are at the same time those who are least likely to attend. This intriguing finding is illustrated in Figure 2, which shows the effect of the programme on school readiness as a function of preference for attendance. Note: The figure shows the effect of the childcare programme on school readiness as a function of the preference for attendance. 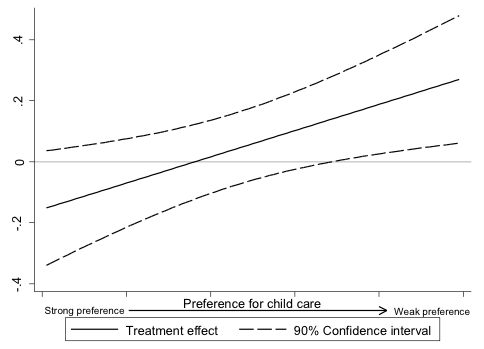 Children who are the least likely to enrol in childcare (weak preference, on the right-hand side of the graph) benefit most from early childcare attendance, while children who are very likely to enrol (strong preference, on the left-hand side of the figure) benefit little from childcare. The figure clearly indicates that children of parents with a very weak preference for childcare (on the far right-hand side) benefit most from early childcare attendance, with their school readiness increasing by up to 20 percentage points. Conversely, children very likely to enrol in childcare (on the left-hand side of the figure) gain the least from their attendance, most likely because they are exposed to a home environment that prepares them well for school entry. Our analysis further reveals that children of parents with a weak preference for attendance are predominantly drawn from low SES backgrounds. First, the gains from universal childcare attendance differ greatly across children, being far higher for children from low SES backgrounds and children with an immigrant background. Second, childcare attendance can nearly eliminate the gap between children of advantaged and disadvantaged backgrounds. Third, and most striking, even though universal childcare programmes are heavily subsidised and in principle accessible to every child, they fail to attract those children who can benefit the most, namely those from low SES families and families with an immigrant background. Why are children from disadvantaged backgrounds less likely to enrol in public childcare than children from advantaged backgrounds, despite benefitting far more from childcare exposure? To address this question, it is important to understand that decisions about childcare attendance are not made by children themselves, but by their parents. Although parents have the welfare of their children in mind when making decisions on their behalf, it is in practice not always possible to separate such future child welfare from the constraints and preferences of parents themselves. In the particular setting of our study, this means that mothers from higher SES backgrounds, who are more likely to work than mothers from lower SES backgrounds, may view public childcare as a welcome means of combining jobs with child-rearing responsibilities. On the other hand, there may be informational deficits and cultural concerns in low SES families and families from an immigrant background. These families may not be fully aware of the benefits of early education, or they may be more critical of pre-school interventions for cultural or religious motives. Despite the heavy subsidies, disadvantaged families may also face higher relative childcare costs than advantaged families. Our findings call for policies that target disadvantaged families and encourage them to enrol their children in public childcare. One way to do this may be through free childcare programmes for disadvantaged families. Examples for such programmes are the free entitlement to 15 hours of childcare for the most disadvantaged two-year olds offered in England, as well as state-level pre-kindergarten programmes in the US, or free childcare initiatives introduced by some German states and municipalities in recent years. In contrast, policies that tie access to free childcare to mother’s employment status – such as the reform recently introduced in England that expanded free childcare from 15 to 30 hours for three- and four-year olds from working families only – may fail in improving children’s outcomes as they are unlikely to draw those children into childcare who would benefit the most. Such policies, however, may be effective at giving mothers incentives to return to work and thereby promote gender equality. Another important angle may be to address informational deficits of the potential benefits of childcare programmes, in line with the EU recommendation (European Commission 2013) of raising parents’ awareness of the benefits of attendance in order to tackle early disadvantage. Furthermore, it seems important to take cultural heterogeneity into account, and to develop a better understanding of the religious and cultural barriers that may lead some parents to refrain from sending their children to public childcare. An example of good practice is the UK’s early years curriculum framework that seeks to promote diversity through parent partnerships to foster knowledge of various religions and cultures and by celebrating diverse religious festivals equally. Cornelissen, T, C Dustmann, A Raute and U Schönberg (2016), “From LATE to MTE: Alternative methods for the evaluation of policy interventions”, Labour Economics 41: 47–60. Cornelissen, T, C Dustmann, A Raute and U Schönberg (2018), “Who benefits from universal child care? Estimating marginal returns to early child care attendance”, forthcoming in the Journal of Political Economy; CReAM Discussion Paper No. 08/18. Duncan, G J, C J Dowsett, A Claessens, K Magnuson, A C Huston, P Klebanov and L S Pagani (2007), “School readiness and later achievement”, Development Psychology 43(6): 1428-46. Elango, S, J L García, J J Heckman and A P Hojman (2016), ‘Early childhood education’, in R A Moffit (ed. ), Economics of Means-Tested Transfer Programs in the United States, Volume 2, University of Chicago Press. Felfe, C, and R Lalive (2018), “Does early child care affect children's development?”, forthcoming in Journal of Public Economics, summarised on Vox. Havnes, T, and M Mogstad (2015), “Is universal child care leveling the playing field?”, Journal of Public Economics 127: 100-14.